How else would you celebrate National Coffee Day with the celebration of the Ninja Coffee Bar™?! The great thing of the Ninja Coffee Bar™ is that it gives you plenty of options. Want a cup of coffee? Done, A travel mug? OK! Half Carafe or Full Carafe all easily achieved. In addition, you get to pick what kind of coffee strength you want especially helpful when you are looking for iced coffee. It also comes with a cute milk frother that makes top of the line, coffee house quality latte and cappuccino. I feel like my own personal barista! This came in the mail, and my husband, a non coffee drinker said "oh, maybe I will drink coffee now." DROP MIC. Seriously, the world is ending. Not to mention, the stunning Emmy-nominated actress, Sofia Vergara have partnered with this venture! The Ninja Coffee Bar™ features revolutionary Thermal Flavor Extraction™ technology, which delivers a variety of sizes and coffee styles, from hot to iced to specialty, while achieving the perfect brew richness level every time. 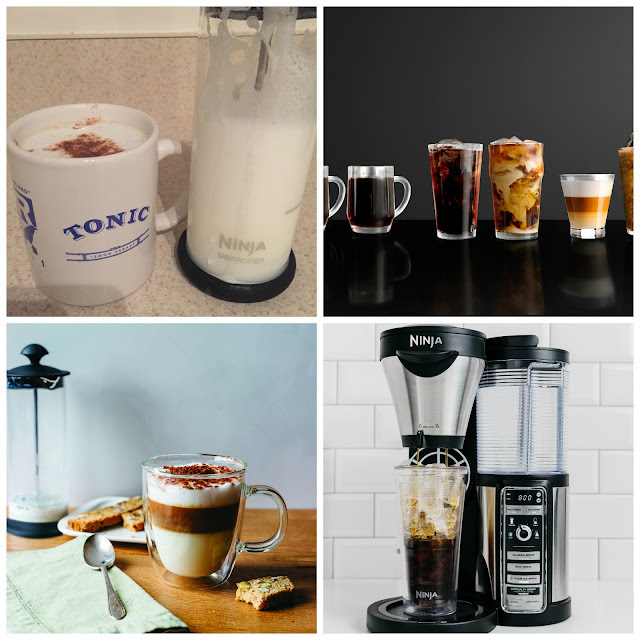 Created with passionate coffee-lovers like Sofia in mind, the Ninja Coffee Bar™ completely reinvents the traditional drip coffee maker by unlocking coffee grounds’ full flavor potential and providing smooth, rich and well-balanced coffee. · Thermal Flavor Extraction™ technology, which delivers a variety of sizes and styles while achieving the perfect brew richness level every time. · Auto-iQ™ One Touch Intelligence Technology delivers customizable options for smooth, rich coffee in a cup, travel mug or carafe. · Makes refreshing iced coffee by allowing users to dial up the richness of their coffee to offset the dilution caused by melting ice. · Offers a variety of brewing options including Classic Brew, Rich Brew, Over Ice Brew and Specialty Brew.